SEATTLE, WA and VANCOUVER, BC--(Marketwired - Oct 30, 2017) - Rad Power Bikes®, a Seattle-based direct-to-consumer electric bike company, today announced their market entrance into Canada, providing Canadian consumers an affordable, energy-efficient and eco-friendly premium alternative to conventional transportation. This milestone marks the company's first international market debut outside the United States. Effective immediately, all Rad Power Bikes models are available with free shipping to Canada, a $400 savings from the previous shipping and delivery option. Equipped with a powerful 500-watt motor, all Rad Power Bikes' Canadian models comply with Federal rules and regulations for electric bikes. Daniel Henderson, Rad Power Bikes' Canadian Business Director, has been preparing for the launch into his home territory. "As a Canadian living on the West Coast of Canada, I have seen the demand for reliable ebikes that complement our active lifestyles grow and mature over the last half-decade. I'm excited to head the expansion into Canada as we launch our headquarters and distribution center in Vancouver, BC," said Henderson. "By expanding our distribution into Canada and now more than ever giving my fellow Canadians a sustainable, value-forward transportation solution, we are going to help so many people discover the joy of ebikes." All Rad Power Bikes are packed with an LCD screen, a twist-grip throttle, and five levels of electric power assist: this level of control offers riders the options of complete electric power, manual pedaling, or five levels of power-assisted pedaling. "Since inception, our mission has been to enhance our customers' lives and improve the communities in which they live through the introduction of new sustainable transportation alternatives. We are excited not only to expand and share our product offering with Canadians, but also to introduce our Canadian Business Director Daniel Henderson," said Mike Radenbaugh, CEO of Rad Power Bikes. "We are working closely together to deliver a uniquely Canadian product experience; we absolutely love spending time in Canada. This is a great next step for us. We are committed to this market and to learning how our products can serve their environment, biking, and lifestyle wants and needs." While standard shipping and self-assembly comes free of charge, consumers in Canada have the option to choose shipping and delivery with Vancouver-based velofix, one of the largest franchisers of Mobile Bike Shops operating in every major Canadian market. The $149 velofix DIRECT program offers consumers a white-glove user experience that includes professional assembly, tuning, and delivery to eliminate any stress or anxiety associated with assembling or tuning their new bike. 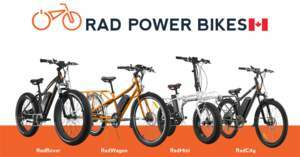 The idea for Rad Power Bikes was born in rural Northern California in the summer of 2007 when the company launched its first electric bike prototypes. Since then, Rad Power Bikes has been at the forefront of electric vehicle technology development launching four unique models and making e-bikes,, ready for the masses. A group of dedicated e-bike enthusiasts, product designers, and entrepreneurs with a passion for business and technology, all three founders were named to INC & Forbes '30 Under 30' list this year. Rad Power Bikes market expansion into Canada marks the company's first international market debut outside the United States.